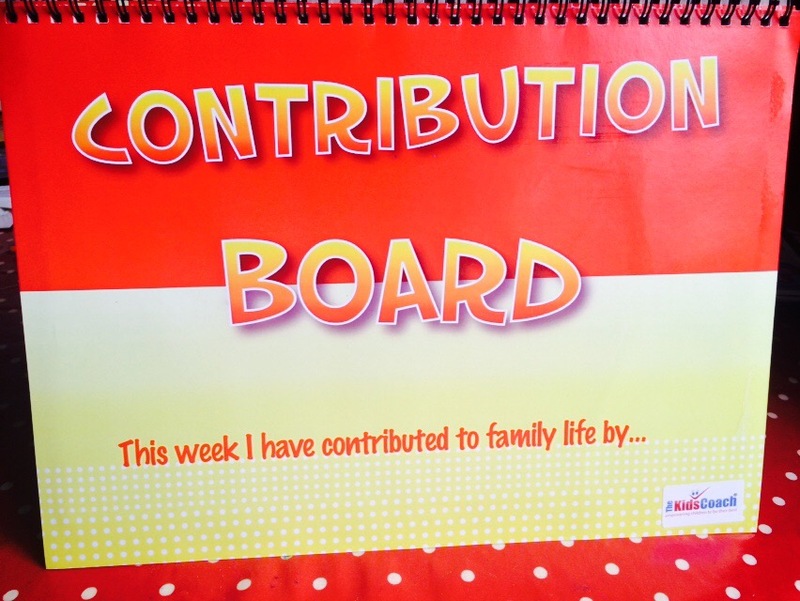 Blog What have you contributed to family life this week? 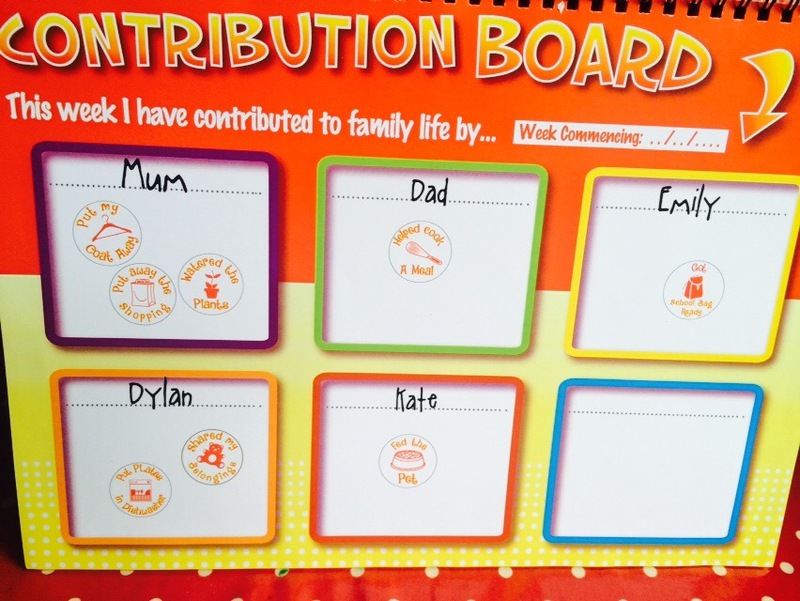 Thanks to Naomi and The Kids Coach we recently received a Contribution Board to review. So for the last week and a half we have been contributing to the board as a family. When I was given this opportunity I thought it was a fantastic idea for a product and was really excited to get started using it. As a parent I have tried so many different methods of rewarding good behaviour for Mini Kat but not thought of trying something like this where we all see the whole families results of what they have done this week. It might even show other members of the family just how much people to for the household which will lead to a more appreciative attitude. So my first impressions where wow, this is pretty big but to be honest, it’s the size of an A4 Notebook. Usually we have used wipe clean boards on the fridge so at first I was a bit unsure on where to put this however what I have found is that the board stands up very easily thanks to the thick cardboard backing and therefore everyone can see what the family have been doing all week easily. 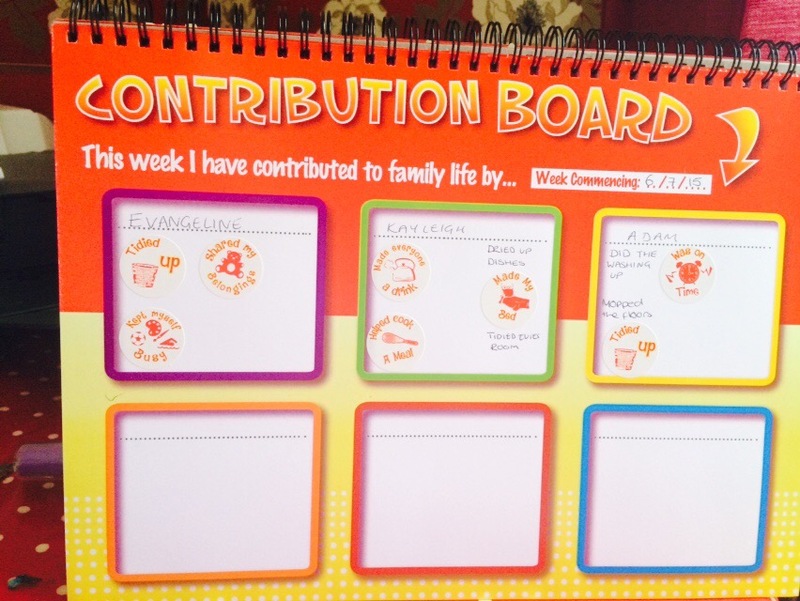 It works in a flip chart type way as it’s not a wipe clean board and uses writing and stickers as the way to promote the families contributions that week so at the end of the week you flip over to a nice clean sheet. The Contribution Board standing up on my dining room table. On each page there is space for up to six members of the family. We are a family of three so there is plenty of space for us. Each week you choose your coloured square and write your name and then you get to work contributing. Each board comes with a helpful page on how to use to get a better understanding of how best to use the board but generally each time a family member completes a task that helps the family and household you add it on the board. 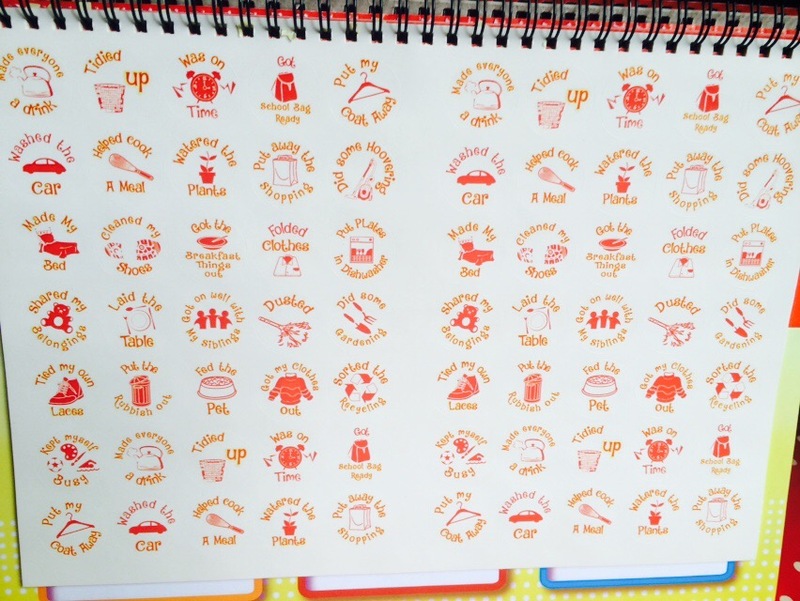 There are loads of stickers included including ‘Emptying the Dishwasher’, ‘Sorting the recycling’ ‘Sharing my toys’ ‘Was on Time’ and ‘Tidying Up’ so there are plenty of pre made choices for activities. Obviously it can’t include every household job so it encourages you to write anything else you do in your square as well. Also to save stickers, if you do a job more than once per week rather than filling up each square we have just been tallying up each time we have completed it to show it’s a frequent task and thus saving on the stickers and space. One thing we have found and something we will probably incorporate next week is because there is only three of us in the family, we are going to use our top square for our stickers and our bottom square for writing up jobs we have done. Overall we have had a lot of fun with our Contribution Board and learnt more about our family life and areas we, as a family, need to work harder in. For example, I, as a work at home parent, seem to do more than my partner in an employed job because I spend more time here so it has shown him how much I actually do for the family and how he can help me more. For Mini Kat she gets excited about getting stickers and questions how and why she has them (she’s four and can’t read yet) so it provides a good talking point and a great way to encourage he good behaviour. Personally some of the stickers weren’t really relevant to us like ones focusing on gardening and washing the car because we don’t have a garden to garden or a car to wash but these are things that a typical family would have access to and are very relevant to the average family. Obviously this is aimed at children so a lot of the stickers are aimed at youngsters however which again, aren’t always relevant to our family and aimed at the average family like sharing with siblings and getting my bag ready however I think all of these are really great and something hopefully we can build on as our family increases in size in the future, our home gets bigger and things like tying shoes become relevant to us. It’s great to see that for us, as a small family, we have time and room to grow with our Contribution Board. I also really like how it shows how the whole family is working together because really, a family is ‘the ultimate team’ and needs contribution, co-operation and competition to work well together. I think the contribution board encourages all of these within every day family life and helps get everyone working together happily. If you would like to purchase a contribution board you can find out more information here.